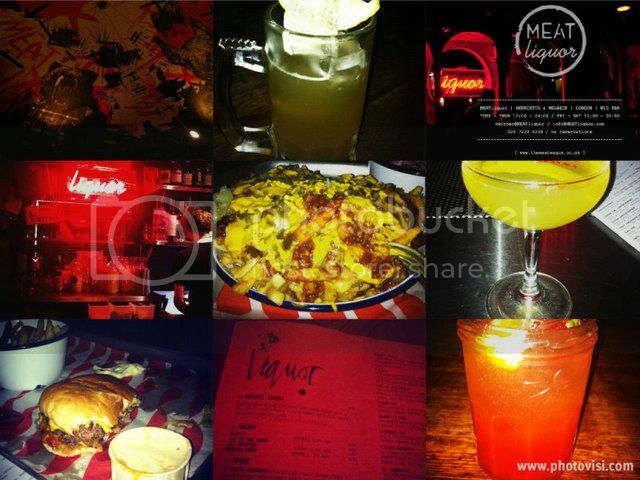 Everyone has heard of MEAT Liquor now, it’s the burger van (Meatwagon) turned pop up restaurant (Meateasy) turned London’s trendiest burger bar. I’ve been here three times now and for very good reasons. The food and drink is delicious, the ambience is very NYC Lower East Side aka one of my favourite areas and the price is cheap. It’s dark and dingy which is perfect for eating a grease dripping burger and whilst their no reservation policy means queues get long during rush hour you can avoid them by going at random times. The first time I went was at 3pm on a Friday and we didn’t have to queue at all. K and I shared the hot chicken wings with blue cheese dip which tasted amazing. The wings were hot and considering I don’t even like blue cheese, I thought the dip was delicious! We both had a cheese burger and shared a portion of fries for main; both were divine. The burger meat was juicy and cooked to perfection (medium-rare) with flawlessly melted cheese and well distributed sauce. The dense sourdough bun holds the fillings together well and does not fall apart, however the generous amount of sauce and cheese plus juicy beef patty means this is a messy burger and the kitchen roll found on each table becomes a key component in the meal. I’m pretty confident that this was one of the best cheese burgers I’ve ever had, a statement I’m sure you’ll agree with if you’ve had one as well. As for drinks, I had a red cocktail aptly named ‘Time of the Month’, disgusting I know but actually a pretty tasty concoction of red wine and gin. Drinks come in jam jars which are a little passé these days but are still a nice touch. The food comes on a tray which is perfect for sharing side orders but does make for messy eating. My second visit was at 5.30pm on a Friday and once again there was no queue however it was almost at capacity (when we left at 7ish the queue was around the block). This time G and I shared the deep fried gherkins, chilli cheese fries and coleslaw to accompany our Dead Hippie burgers. I don’t like gherkins but these were delicious and the chilli cheese fries whilst hot and greasy were incredible. The Dead Hippie is a double cheese burger with special sauce and tastes magnificent; definitely a favourite of mine. Apparently it’s a Big Mac rip off but considering I’ve never had one (McChicken sandwich all the way) I wouldn’t know. I didn’t rate the coleslaw too much but its cooling taste meant it went well with the chilli cheese fries. The burger was just as good as my previous experience with its 2 perfect medium rare, juicy patties and sturdy bun but again a very messy encounter. To drink I had the Cyder Car and Silver Angel cocktails which were both nice but not something I’d probably order again. Whilst I love cider I was not overly fussed with martini also included in the Cyder Car and the Silver Angel was just a little too bitter for my liking. My third visit was also on a Friday evening at 6pm where we were lucky again to not queue. I imagine the hype is slowly dying down thus making it a lot easier to get a table than a few months ago. I had the Dead Hippie again which I was just as tasty as the first time and shared chips and onion rings with my friends. The onion rings were huge, crispy and totally delicious. To drink I had the Henrietta Fizz which was deliciously fruity and Meatjito which is obviously their own take on the always popular mojito. Both of these were delicious and I would definitely recommend them if you like fruity and sweet cocktails. 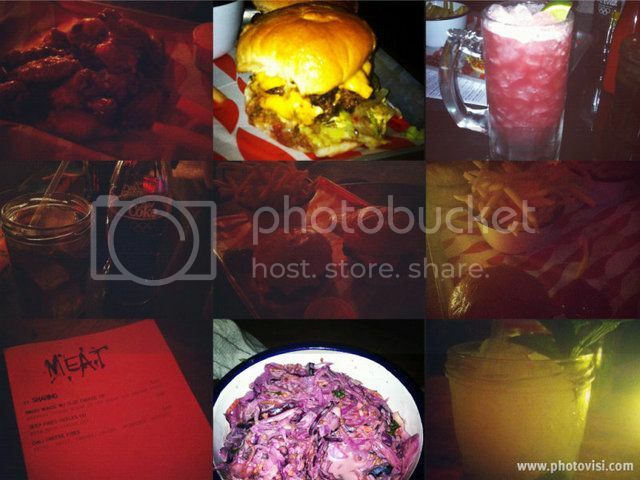 If you like eating burgers to great music and strong cocktails (in the dark) then I can’t recommend MEAT Liquor enough, the food is great quality and excellent value and the atmosphere transports you far away from your nearby Oxford Street location. Oh my God. I'm hungry. This does sound great, I will have to go at some point!